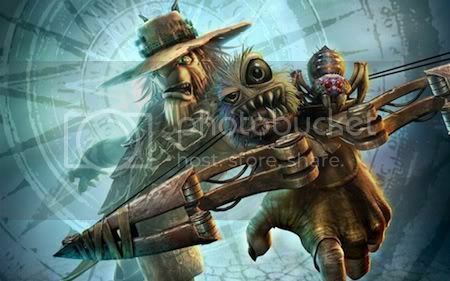 This week we discuss Oddworld’s Inhabitants Oddworld: Stranger’s Wrath. In which Leon, Tony and Darren Gargette attempt to establish whether Stranger’s hallowed reputation is justified, as well as delving into the history of Oddworld; from Abe’s days as a prestigious PSone platform star, through Munch’s brief time in the sun to Stranger and what the future may hold for Oddworld Inhabitants. Cane & Rinse 21 was edited by Sean O'Brien. If a Quick Rinse was to sit on your gun, it'd shout abuse at you, too! I never played this 'back in the day', although I absolutely loved Abe's Oddysee and Exodus. I recently tried the HD version after it was free on PS+ but I didn't enjoy it. I thought the graphics, sound and general atmosphere were excellent, and I did like the game but thought it became really repetitive quite quickly. Fun for a bit though. I'll download this though as its always interesting to here such in depth analysis of games I've played. Just listened to this episode. One of my favorite games, although I never ended up beating it. I couldn't get past that timed section. It could have been because the dash mechanic was a little dodgy when using mouse and keyboard, but it was also very difficult on its own. I would like to replay it, but I really don't want to do that stuff towards the back end of the game again. Always Frazzles my mind to see an old issue get a comment/listen but that means that Leon, Tony and Jays vision has worked!